This was a good year for apricots and a colleague has a tree that¹s packed. So a month ago, she picked a few, just enough for us to eat at lunch breaks and for her to offer me a jar. I took the jar home and promised my colleagues that I'll make crumb bars with apricot jam filling. But as you know, summer time is always full of activities, family and friends come from abroad and unfortunately I find little time to spend in the kitchen. I had hundreds of messages requesting the crumb bars and I was always making excuses and nagging about the fact that there's no time to bake, I'm such a bad liar :). Yesterday, I finished work and headed home directly. I confess I was tired and all I wanted was a good cup of coffee on the balcony as the sun goes down, but I said I'd probably have to make those crumb bars and surprise the girls. The results were excellent, they loved them and requested for more!! Oops!!! Heat oven to 350°F (180ºC). Grease an 8-inch square baking dish. Combine the flour, sugars, baking powder, and salt. Add the butter and mix with your fingers until crumbly. Add the egg yolk and vanilla and mix until the dough comes together but is still crumbly. Use your fingertips to press half of the dough evenly into the baking dish, pushing the dough up about 1/4 inch around the edge. Spread the apricot jam evenly over the crust. Crumble the remaining dough over the top. Bake until golden, about 35 minutes. Cool on a wire rack for 10 minutes before cutting. Préchauffez le four à 180ºC. Beurrez un moule carré. Mélangez la farine, les 2 sucres, la levure et le sel dans un saladier. Ajoutez le beurre et avec vos doigts mélangez jusqu'à ce que le mélange soit granuleux. Ajoutez le jaune d'œuf et l'extrait de vanille et mélangez jusqu'à obtenir la consistance d'une sorte de «crumble». Étalez la moitié de la pâte dans le moule. Répartissez la confiture d'abricot sur toute la surface de la tarte et saupoudrez le dessus des «miettes» de crumble (l'autre moitié de la pâte). Enfournez pour 35 minutes. Laissez refroidir 10 mn avant de couper en carrés. Divine, I'm sure! I love bars and apricots. These bars are gorgeous, perfect with a cup of tea! 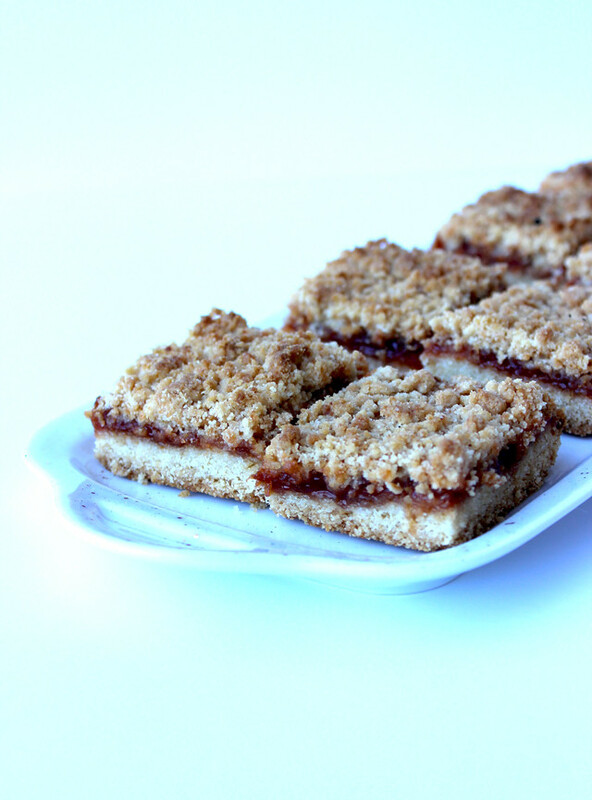 I totally love a good apricots which are - sadly - hard to find here but these crumb bars look fantastic! Oooh, I bet these would be good with all kinds of different jams! What a great recipe! I love that it's easy enough for me to try. Thanks for sharing. 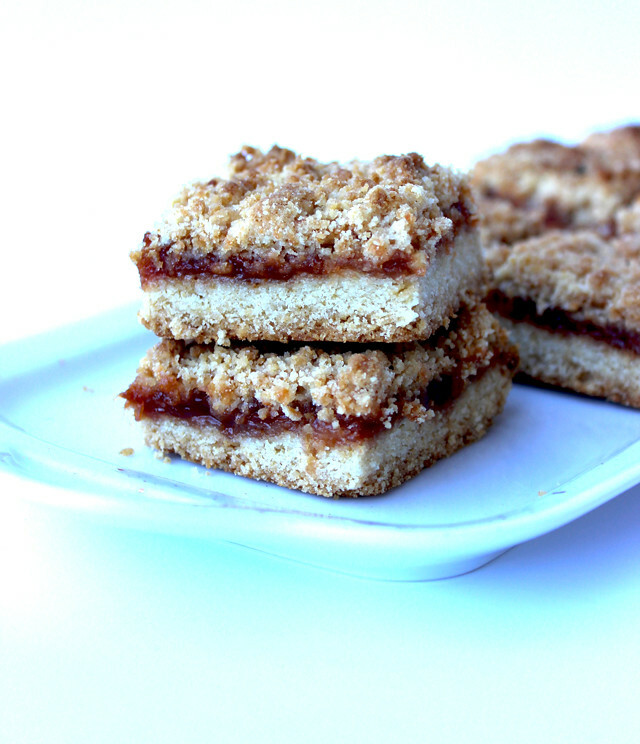 These crumb bars look fabulous, Cherine. These look absolutely delicious! I can't blame them for loving them! It's tea time here..the plumber is repairing (or destroying rather) my "salle de bain" I absolutely need one of those bars and a cup of coffee! Thanks for the recipe! 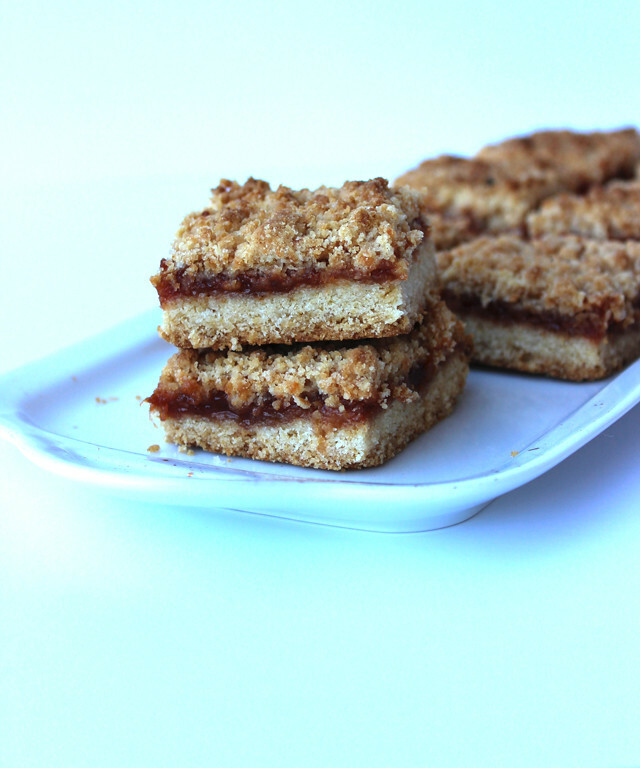 I just made apricot bars, too! Aren't they delicious? And a nice change from the usual chocolate variety desserts.